These Chips had a sturdy and crispy crunch. The Snap Test saw a Chip broken neatly in half. The minimal oil was sufficiently soaked up by the potato to provide a sharp and sturdy crunch. These surface of these medium thickness Kettle Cooked Chips was a rather bumpy, uneven one, a bit like a western desert landscape; mostly yellow, with a little red and dark coloring here and there. There was a crispy texture that had been darkened by oil, which had also folded a few over. 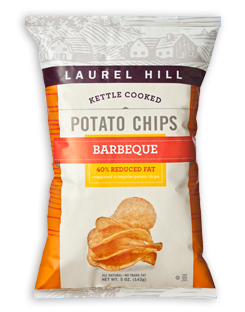 Before beginning it should be noted that these Chips do not contain saturated fat. This is a rarity in the Wonderful World of Chips and Crisps. Unfortunately, they didn't appear to contain much in the way of Barbecue seasoning either. The normal, warm and comforting potato flavor was not to the fore by oil and salt either. However, because of the healthier properties of these Chips we persevered and sprinkled some paprika on to spice them up ourselves. That's better!